At first this was because my writing age seemed too young to be worthy of recognition. But in subsequent years, I didn’t because the day happens to align with one of the busiest times of the year at my job – a period punctuated by double-digit overtime hours, six-day work weeks, and, for me at least, a never-ending focus on just getting the job done. I scraped myself out of bed, in the dark. My knee was hurting – it had been for some weeks now; a gym injury from overuse. I performed my usual morning routine of washing, breakfast, and reading blogs. Because it was a Thursday, I also swept my kitchen and bathroom floors before leaving for work. I rode my bike to work, as I do most days. The forecast was calling for rain, but it wasn’t raining yet. So I took advantage of not yet needing to body wrap myself in nylon-polyurethane cycling gear to stop at the grocery store for some hummus. I’d been out all week and am used to eating it every day as part of my lunch. I might have considered buying my lunch that day – something indulgent from somewhere within the business world bread basket surrounding my office. If not that, at least a celebratory cupcake. My boss once bought me a red velvet cupcake for my actual birthday and it remains one of the most scrumptious desserts I’ve ever consumed. But, by the time I was ready to start thinking about lunch, it had turned torrential and grey outside. Plus, I’d grown too tired and achy to walk all the way to Robson Street for a cupcake after my Tabata class half an hour earlier at the gym. Tabata is a form of high intensity interval training, and this particular session saw us doing eight sets of mountain-climbers and eight sets of push-ups back to back. I didn’t do my knee any favours in that class, although I did work my shoulder, which also hurt from my ongoing tendonitis. Every day I’m getting older, and not just as a writer. I do a lot of writing in my work: writing emails that people don’t read, training documents that people don’t read, revisions to program curricula that people don’t read. During this busy period, I also update spreadsheets, print documents, photocopy documents, cut up papers, sort papers, locate lost papers, and of course, good old-fashioned, never-ending paper-pushing. I didn’t want to believe E would harm a child, but was this person even really still E? I also texted two friends to tell them today was my writing birthday. Only one – the one who isn’t also a writer – texted back. When I finally left work – overtime, thoroughly exhausted, and mildly peeved to still not receive a text from my writer friend who, more than anyone, should’ve cared about the day’s significance for me – the rain had stopped, so I once again eschewed my rain gear. It’s an unwritten rule of cycling in Vancouver that if you arrive at your destination after 8am and 5:30pm, you will get rained on, so I should have known better. And also not presumed I could out-ride the rain in my present state instead of stopping to suit up. 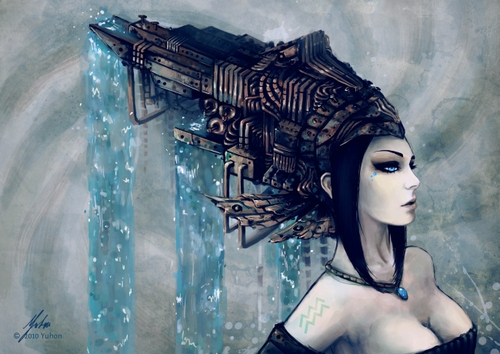 Aquarius, by Yuhon (or me after my bike ride home). I ate eggs, Tater Tots, and (unintentionally) weak tea for dinner, for by now I was overworked, tired, peeved, and cold from getting soaked through and in need of some serious comfort. Because it was Thursday, I also vacuumed my carpets while waiting for the food to be ready. As I did so, the vacuum’s unrelenting drone seemed to uncouple my body from my conscious mind, which rose high above the challenges of the day – rose to the level of my subconscious, which whispered like a lover words to be written: parts of this very blog post; more of the snippet I’d emailed myself; what comes next in the WIP I’ve been working on since 2005 and I hope to complete in draft by Easter. The key life phrase of the sign of Aquarius is “I progress”. As a writer, that’s exactly what I do. Every day. Who’s even heard of a writing birthday anyway? No wonder mine lacked fanfare. In the end, I commemorated the day the only way a writer can. 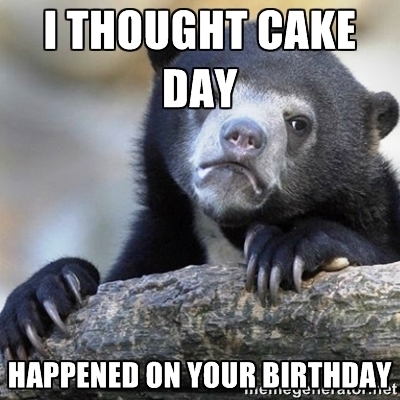 Do you celebrate a writing birthday? If yes, how? How do you commemorate any other writing-related milestones? Let me know in the comments. This entry was posted in Writing and tagged Astrology, Celebration, Email, Ideas, Inspiration, Novel, Novel writing, Writing birthday, Writing inspiration, Writing milestones. Bookmark the permalink. Happy writing birthday Janna! Though I’ve never personally heard of such a thing 🙂 That gym routine sounds tough. At least as a jogger/runner you have the option of slowing down or stopping without some fanatic instructor yelling at you. Jersey’s equivalent of the rain rule is that it WILL start raining just as you reach the furthest point from home or office in shirt sleeves. I think every writer should celebrate a writing birthday, for I think once we truly become writers we’re never the same again and that that day of change deserves commemoration. Tabata isn’t so bad. It too is about going at your own pace (and you have to set a reasonable one if you want to last all eight rounds). The instructor only counts the time, giving a three-second count up, a ten-second warning, and a three-second countdown (the latter of which is actually really helpful for staying motivated). Jersey’s rain would never get me; my father trained me at an early age to never leave home without a jacket, even in summer, and the lesson struck. It’s like a muscle; it may get weak from neglect but can always be re-trained. I think mine was in May. I know the year was 1995, so I’m coming up on 20 years Wow. I would have gotten something published had those first efforts 1) met with better results than a nice, personal rejection letter, and 2) I hadn’t had three kids to homeschool, and me with a chronic disease of no energy. The WIP has 15 years of my life invested in it – we’re finally getting to the end of Book 1 (and I’ve learned to write during the process – the rest should be faster). Thanks for the idea: I shall celebrate 20 years with first publication – won’t that feel special? I’ll decide they happen on the same day – and who will be able to prove otherwise? Writing birthdays are often difficult to pin down to the exact day, which is okay since it’s mostly symbolic anyway. Celebrating your year 20 with publication sounds wonderful. Add in some wine and chocolate (or however you usually indulge yourself) and it’ll be a right writerly party!